How exorbitant is the dollar’s “exorbitant privilege”? As recent literature suggests, the demand for safe assets appears stable over the long run, and fluctuations in the stock of public debt crowd in or crowd out safe debts issued by financial intermediaries; the financial sector endogenously creates safe assets to fill any gap left by insufficient government debt.1 However, as observed during the Global financial crisis, doubts cast on the safety of ‘privately produced’ safe assets have often led to crisis. A lesson that was learned from the crisis is that the supply and demand of safe assets is an important reference point for assessing the stability and potential vulnerabilities of the financial system. From the perspective of global financial stability, attention should be paid to ‘US dollar-denominated’ safe assets in particular, because the role of dollars in the global financial system is as important as ever. 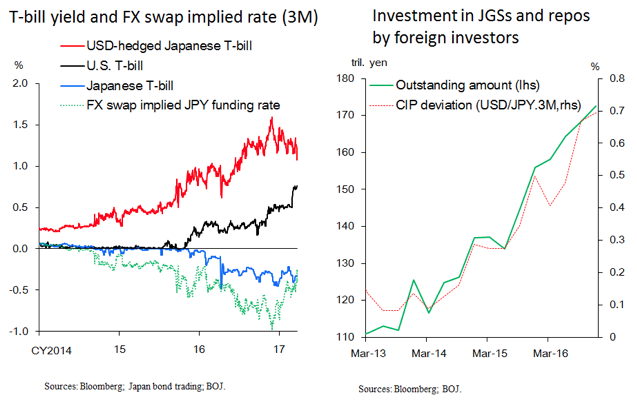 In this respect, Bank of Japan Deputy Governor Nakaso (2017) provides an interesting view, focusing on FX swaps that enable the hedging of an FX risk exposure. He suggests that conditions in the FX swap market affect the aggregate availability of dollar-denominated safe assets, because FX-hedged non-US sovereign securities are regarded by investors as safe assets substitutable for US government securities. In the following, taking FX swaps between dollars and Japanese yen, we show how and why investors have recently shown greater demand for FX-hedged yen-denominated assets, whose nominal yield is negative. In an FX swap, the parties to the transaction simultaneously conclude the purchase and sale of two different currencies on two separate delivery dates in the opposing direction. For example, a Japanese bank would purchase some dollars against the yen in the spot market, and yen against the same amount of dollars in the forward market, which is in effect borrowing dollars against yen collateral. On the other side of this transaction, there is an investor who would purchase some yen against the dollar in the spot market and dollars against the same amount of yen in the forward market, which is in effect borrowing yen against dollar collateral. When real money investors – such as sovereign wealth funds, reserve managers, and private investment funds – obtain yen funds through FX swaps, they usually do not allow the yen funds to sit in a bank account. They typically invest the funds in Japanese government securities, and such investments have increased in recent years. 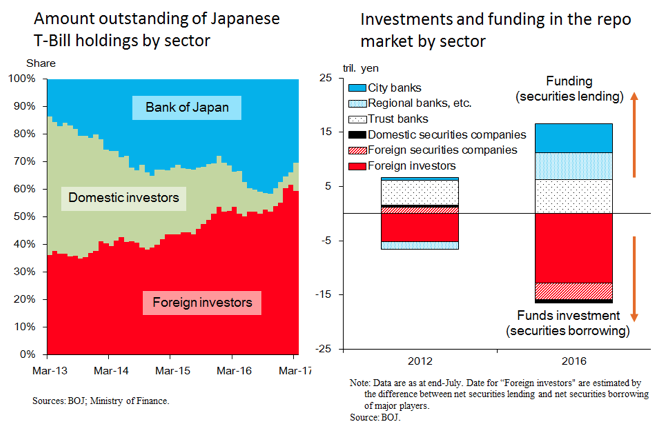 Figure 1 shows the amount of outstanding Japanese T-Bill holdings by sector. While the proportion of domestic investors has declined, that of foreign holders has increased from about 40% to 60% over the past two years. Yen funds could also be deployed in the Japanese repo market, where Japanese government securities are used as collateral. In that market, we have observed an increase in capital inflows from foreign investors. In addition, they have increased their investments in medium-term Japanese government bonds as well as T-bills and repos. Against the background of monetary policy divergence between Japan and Europe on the one hand, and the US on the other, Japanese and European financial institutions have increased their investments in dollar-denominated financial assets, which leads to an increase in the demand for hedging FX risk. Even when the demand for dollars increases in the FX swap market and CIP deviations widen, however, global banks such as US banks are less likely to engage in arbitrage trading by increasing the supply of dollars. This is due to regulatory reforms which reduce banks’ balance sheet capacity to intermediate dollars. Against the increased hedging demand, as global banks refrain from engaging in arbitrage trading, we see increasing relative importance of real money investors as suppliers of dollars in the FX swap market. Widening CIP deviations signify an opportunity for them to raise non-dollar currency funding at a very low rate. For example, the FX swap implied yen funding rate has been declining into deep negative territory (Figure 3). Hence, investments are made in Japanese government securities, even if their nominal yields are negative, and the investors secure positive profit without taking on FX risk. Indeed, because of the widening CIP deviations, the yield on dollar-hedged Japanese T-bills is higher than that on US T-bills. The increase in investment in yen-denominated safe assets by foreign investors has been in tandem with the widening CIP deviations. Several examples of real money investors that have increased the demand for FX-hedged Japanese government securities follow. The primary portfolio of PIMCO’s ‘Foreign bond fund (US dollar-hedged)’ comprises hedged non-US fixed-income instruments. The fund manager says, “We can buy even negative-yielding assets and hedge them into US dollars to create attractive positive yields. […] Short-dated Japanese debt is as close to a risk-free instrument as is possible” (Chappatta and Wong 2016). As of the end of March 2017, about half of the portfolio assets of this fund are Japanese government securities. Another example is the Reserve bank of Australia (RBA) as a reserve manager. According to the bank’s Annual Report (RBA 2016), RBA picks up extra yield by putting around 60% of its foreign reserves into yen and then swapping most of them back into Australian dollars and US dollars. These examples suggest that FX-hedged non-US sovereign securities are regarded by real money investors as dollar-denominated safe assets substitutable for US government securities. This has a very important implication for the global safe assets problem. The world needs a constant expansion of the stock of the US public debt as a safe asset, but that expansion itself would eventually make the US government insolvent and threaten the ability of debt to serve as a safe asset. In other words, the global financial system faces the Triffin Dilemma. FX swaps seem to cure this dilemma by making non-US sovereign securities substitutable for US government securities and accommodating the demand for dollar-denominated safe assets. However, it is difficult to fundamentally resolve the dilemma, because FX-hedged non-US government paper is not always a stable substitute for US government paper, as explained below. Japanese inward bond investments tend to decline sharply in times of market stress (Figure 4), which suggests that foreign investors, including reserve managers and sovereign wealth funds, have a tendency to reduce their dollar-hedged investments in Japanese government securities and hence their dollar supply in the FX swap market in times of stress. For example, as our studies show (Arai et al. 2016 and Iida et al. 2016), when currencies of emerging market economies started to slide after the Chinese stock market crashed in the middle of 2015, emerging market reserve managers, who were aware of the potential need to defend their currencies, refrained from offering dollars in the fixed-term FX swap market and shifted their dollars into more liquid markets, such as the US T-bill market. A similar phenomenon was observed when capital outflows from Asian emerging markets intensified in the first half of 2016. In short, whereas FX-hedged non-US government securities are regarded by foreign investors as substitutes for US government securities in tranquil times, this could easily break down in times of market stress. When real money investors, such as reserve managers, reduce their dollar-hedged investments in non-US government securities and hence their dollar supply in the FX swap market, CIP deviations (i.e., dollar funding premiums) increase. This then induces non-US banks to cut their overseas loans. Indeed, Japanese banks’ lending to Asian emerging market economies has recently decelerated. This is not only because of slower economic growth in Asia, but also due to increasing dollar funding costs reflecting the widening CIP deviations.4 If the funding availability of non-US banks is constrained by the decrease in the dollar supply from real money investors in the FX swap market, non-US banks are forced to reduce their lending to emerging market economies further. Such a cut in banks’ lending would put downward pressure on the growth of emerging market economies, and then lead to currency depreciation of those economies and a decline in commodity prices, reflecting weaker demand. 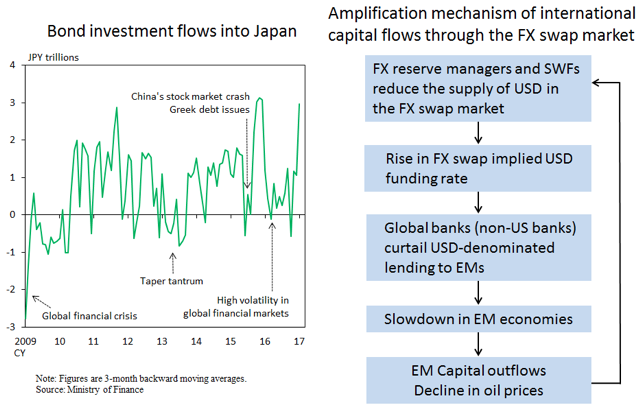 Subsequently, reserve managers of emerging market economies and sovereign wealth funds of oil-producing economies restrain the supply of dollars further in the FX swap market. An interest rate increase in the US could amplify such pro-cyclicality in international capital flows if it brings about a rapid and large-scale capital outflow from emerging market economies. The fact that FX-hedged non-US sovereign securities lose their status as safe assets in times of market stress provides the US with the ‘exorbitant privilege’. Since the FX swap market cannot be regarded as a stable source of US dollar funding, non-US financial institutions may face dollar funding liquidity risk in times of stress. In contrast, US financial institutions have stable dollar funding sources such as retail deposits, and hence enjoy an absolute advantage in dollar-denominated international financial intermediation. Another important point is that the exorbitant privilege reflecting CIP deviations has distributional effects which would raise financial stability risks. While the US (and economic entities who have deployable dollar funds) can gain profits on FX swaps, non-US financial institutions need to pay a dollar funding premium. If CIP deviations stay high for long periods, the behaviour of non-US financial institutions will be affected in several ways. Facing a rise in dollar funding costs, for example, they would compress their assets, such as loans to Asian emerging economies. Alternatively, they would take excessive risks. 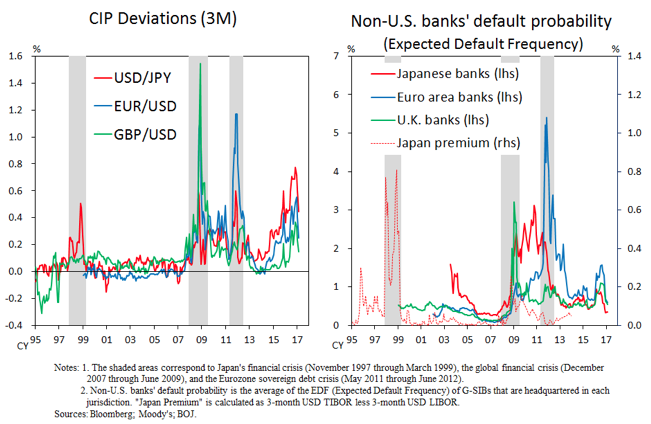 Non-US banks may increase duration mismatch risk and credit risk in order to cover increasing costs. Widening CIP deviations also cause a rise in hedging costs for non-US investors on their dollar-denominated assets, which may induce them to reduce their hedge ratios and take on naked exposures. Indeed, in response to the rise in hedging costs, some Japanese insurance companies have recently accumulated US corporate bonds and mortgage-backed securities, which offer higher yields than US Treasury bonds. At the same time, others have reduced hedge ratios somewhat, although the degree of their risk taking has not been excessive so far. In sum, while the demand for dollar-denominated safe assets can be accommodated through FX swaps, on one hand the US enjoys the exorbitant privilege, and on the other, non-US entities take more risk. If such a distributional effect becomes large enough to induce non-US entities to take excessive risk, this would threaten financial stability. Again, through FX swaps, we face tension between the demand for dollar-denominated safe assets and global financial stability; the global financial system indeed faces a new Triffin dilemma. Editor’s note: The views expressed are the authors’ and not necessarily those of the Bank of Japan. Arai, F, Y Makabe, Y Okawara and T Nagano, (2016), "Recent trends in cross-currency basis", Bank of Japan Review, 16-E-7, September. Borio, C, R McCauley, P McGuire and V Sushko (2016), “Bye-bye covered interest parity”, VOXeu.org, 28 September. Chappatta, B and A Wong (2016) “World’s biggest bond traders undeterred by negative yields”, Bloomberg news, 22 August. Cœuré, B (2017), "Bond scarcity and the ECB’s asset purchase programme", Speech at the Club de Gestion Financière d’Associés en Finance, Paris, 20 April. Eichengreen, B (2010), Exorbitant privilege: The rise and fall of the dollar and the future of the international monetary system, Oxford: Oxford University Press. Iida, T, T Kimura and N Sudo (2016), “Regulatory reforms and the dollar funding of global banks: Evidence from the impact of monetary policy divergence”, Bank of Japan, Working Paper Series, 16-E-14, August. Golec, P and E Perotti (2017), “Safe assets: A review”, ECB, Working Paper Series, No 2035, 14 March. Nakaso, H (2017), “Monetary policy divergence and global financial stability: From the perspective of demand and supply of safe assets”, Bank of Japan, 20 January. RBA (2016), “Operations in financial markets”, Reserve Bank of Australia, Annual Report. Smaghi, B (2011), “The Triffin dilemma revisited”, European Central Bank, October. See, for example, Golec and Perotti (2017) for the ‘safe assets’ issue. Cœuré (2017) points out that non-Eurozone investors are increasingly holding a larger share of German government bonds issued with an original maturity of up to two years. For example, portfolio assets of PIMCO’s ‘Foreign bond fund (US dollar hedged)’ include not only yen-denominated securities but also euro-denominated securities. See, for example, Arai et al. (2016), Borio et al. (2016), Iida et al. (2016) and Nakaso (2017). Our analysis based on the VAR model suggests that a rise in CIP deviations puts downward pressure on Japanese banks’ lending to Asia. See Smagi (2011) for a modern version of the Triffin dilemma. See Eichengreen (2010) for the issues on the exorbitant privilege.